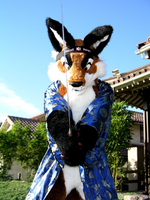 Welcome to the anthrofox.org image gallery! Zao Fox Village ("Kitsune Mura") in Miyagi Prefecture, Japan. Located near Shiroishi, the nearest Shinkansen station is "Shiroishizao" Station. You will want to take the Tohoku "Yamabiko" Shinkansen from Tokyo Station to Shiroishizao Station. As of 2016, this train uses the E5 Shinkansen, which is Japan's fastest, but the train travel time is still over 2 hours, so pack snacks if needed (you can buy plenty at Tokyo Station). After this train ride, you must hail a cab to Fox Village, with an approximate fare of USD $42 (mine was about 4180 yen in 2016) each way and about 20 minutes travel time. There is an office in the Shiroishizao Station that will call the cab for you. The cab driver will give you a return slip, which you must present at the front desk of Fox Village when you are ready to depart. Fox Village can then call the cab for you. There is a small eating area inside the gift shop with simple snacks for sale (such as cookies and soda), so pack more substantial food accordingly if needed. (But do leave backpacks and similar belongings with the front desk so the foxes don't smell any food on you.) Also note that Shiroishizao Station is small and has only a few small food vendors on-site; hence the emphasis on food options here if you plan to make this a day trip. Your lunch choices are limited unless you plan to explore Shiroishi itself. It is advisable to get to Fox Village very early (they open at 10AM) as the "Fox Hugs" were at 11AM the day I was there. Plus often animals will be a little more active earlier in the day. Therefore it is advisable to get an early Shinkansen from Tokyo Station (before 8AM), and since it takes time to navigate the (very large) train stations in Japan, it's advisable to get there 30 minutes before your Shinkansen departure. You may find yourself waking up around 5-5:30AM depending where in Tokyo you are actually staying. As of 2016, Fox Village has a modest admission fee of 1000 yen, plus another 400 yen to hold a fox ("Fox Hugs"), and another 100 yen per bag of food pellets if you desire to feed them. This is quite reasonable for such a unique and enjoyable place! 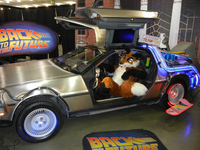 F.J. McCloud posing with a DeLorean time machine replica! Adventures at Further Confusion 2016 at the San Jose Marriott. 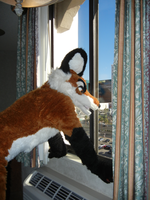 F.J. McCloud admiring the view and pondering where to go first from the Excalibur Hotel, Las Vegas, November 2015. 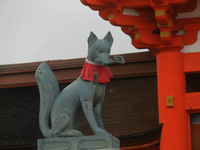 The famous fox shrine, not far from Nintendo Co., Ltd. HQ and the inspiration for Fox McCloud in StarFox! Star Fox at Fanime Con 2010, San Jose, California. Showing off Star Fox in Sonora, California. Antics at Further Confusion 2008, at the Doubletree Hotel in San Jose. Visiting the red foxes again, this time in winter. Sir Robin of Foxley at Northern Renaissance Faire, 2007. Smash Bros moments at Fanime 2006, San Jose! 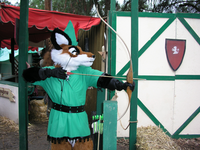 Showing off as Robin Hood at Tulare County Renfaire 2006. 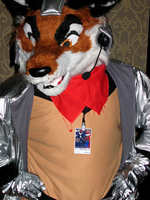 Debuting completed SNES StarFox "Fox McCloud" outfit at Pixieland 2006, in Concord, CA. Wildfire Fox celebrates Yippee's birthday! Calaveras Freezing on Such a Spring Day. A cold, miserable renfaire graced by fresh snowfall, which felt more like work than fun. 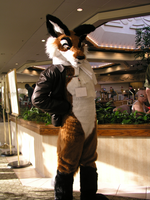 Further Confusion 2006 was the debut for Wildfire Fox by Primal Visions. It was also where our massive 3-part "Sir Robin of Foxley" variety show act was performed. Testing out several outfits at Further Confusion 2005! This was the year we performed the famous "Boot to the Head" skit in the variety show. 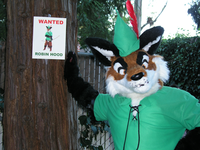 First test of a new Robin Hood outfit.